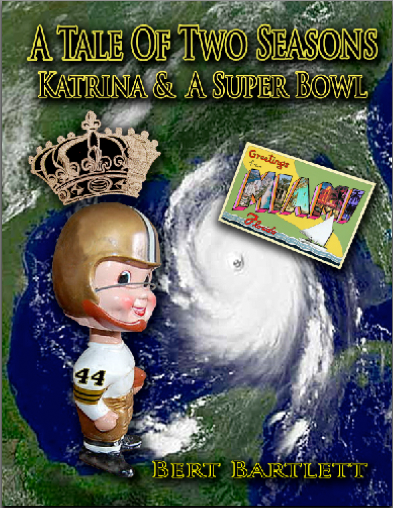 As mentioned in the book, A Tale Of Two Seasons, Katrina & A Super Bowl, since their inception, in the sports landscape, the Saints have long had an image somewhere in between the lovable losers of the Chicago Cubs in Major League Baseball and the spiritualism of Notre Dame in college football. Recent events in this suddenly turbulent off season have changed all that. Indeed, the Saints are now in something of an identity crisis. Thugs? Cheaters? Manipulators? Tight Wads? Frauds? All these and more have been tossed at the franchise in conjunction with the bounty scandal reports and the contract snags of Drew Brees. Football – at any level – has always been a sport full of hot air machismo. “Bounties” on opposing players leading into contests have long been part of it’s fabric, whether it’s emotional release and hoodwink chatter in the locker room, or in modern times, at the pro level, lures of cash or steak and lobster dinners. Reportedly, in the ’09 post season when the Saints finally won a title, $10,000 was offered inside to anyone who could “take out” Brett Favre. For pro players who make on average about $1.2 MM per annum, that’s chump change. Anyway, the Saints did hit Favre mercilessly, as they did Kurt Warner the week before that, but nobody succeeded in “taking them out”. Nor were any notable illegal hits called in those games, though a few plays looked close to being so. Neither’s knees were torpedoed, which is the definitive way to assassinate a quarterback and maybe ruin a career (Carson Palmer once suffered that fate in a playoff game against the Steelers and hasn’t been the same since. The Pittsburgh DT who made the hit said he just was too excited and didn’t intend to hurt him). Tampa Bay quarterback Josh Freeman claims his knees were torpedoed by the Saints in the 2010 regular season. Roman Harper developed a rep as a dirty player with his hitting while blitzing, and was called for some illegal hits, though a close review of some of them indicate him consciously avoiding helmet to helmet contact to stay within the rules. With concussions alarming all of the football community, and numerous retirees continuing to show ill after affects long after playing the game, this is a politically correct era of take it easy, so to speak. For all it’s sanctioned violence that lures fans to the games, there is no fine line with the refs anymore when it comes to unnecessary roughness. To his credit, after the beating he took, Favre had no ill will, attributing it to just being football, which it was. He was the best player on the field that day, all things considered. If not for one careless interception at the end of the game, the Saints may have never made it to the Super Bowl. Yet for all the rancor, in general NFL players are mostly brotherly loyal to one another, and none of them wants to end another’s career. Contract holdouts are respected, not brandished. Making an opponent ineffective for a big game is another matter. Terminal hits have been far and few between, and long afterwards they have been revealed to be incurred by stimulant abuse or steroid rage. More often than not, the “target” is praised in the other locker room, win or lose. About the only bright spot with Saints’ bounty reports is that nobody was permanently hurt, that we know of. For all of his offensive forward thinking, head coach Sean Payton has been influenced by old school football thought, notably by traditionalist Bill Parcells. And bounties have extensive histories in numerous NFL locker rooms, most of them which we will never hear about. This is no excuse for his tolerance, but it is an explanation as to why he turned the other cheek. Apparently, GM Mickey Loomis felt this was his coaches’ domain. Defensive coordinator Gregg Williams was just toying with old unwritten rules of motivation. Ironically, in this institutionalization of the scandal, the Saints had an admirably non-meddling organizational chart. The league will care about none of this when they impose penalties, fines and suspensions, all of which will be significant and dramatic. Offensive assistant Pete Carmichael did a fine job of calling the plays and working with Drew Brees when Sean Payton was hurt with a knee last year, so we will see much more of him and that, perhaps a half season of it. The Saints will be made poster boys for the league’s Mutiny On The Bounty campaign, but the lasting scars will be from the inevitable loss of draft picks, and a thinning of the roster, which has been as deep as any in the league for the last several years. This is acutely negative this season, having already traded this year’s top pick for Mark Ingram, and with Drew Brees’ new pending contract preventing the Saints being able to afford everybody they want, notably stud protector Carl Nicks and the accomplished Marques Colston. Colston may leave for more money, but in his heart he has to know he may never re-establish the superb chemistry with Brees he has worked so hard to obtain for over the years. He may not be nearly as effective with another team. If he is wise, he should not leave if New Orleans’ money offer is close. And the Saints should make it as close as possible. Nobody has been more of a team player than Brees. That he has been franchised for the time being still leaves a long term deal, what he deserves, possible by late July. Yet when it gets right down to it, if the Saints contract offer in total dollars is good, but not to his preference in immediacy of some of the payments (supposedly they were apart on when $5MM of it is paid), he has to ask himself how important it is to be surrounded by good players, because the Saints can only afford so much to pay under the nuances of the salary cap. But no doubt, over time, # 9 deserves the biggest bucks that the league has at that position. Why should he be paid less than Manning or Brady? He shouldn’t. But not as much of it up front as he would like? It’s not as if he’s going to go hungry…..
General managers always wince when they pay record contracts to players who are beginning to age, because their investment is only one injury or some complacency away from a bad deal. This was evident with star running back Shaun Alexander of Seattle, who got a bum knee at the wrong time. Daniel Snyder of the Redskins has to be the record setter for bad big investments in free agents. But the smart GM”S realize that if they overpay on a new deal, part of the justification to do so is that the player had been underpaid for a few years, as Alexander was, and Brees has been, since 2009, when he bested Manning in the Super Bowl. Saints’ gumbo all tastes a bit rancid at the moment. Only time will tell if everything adds up with a rosier outlook. But the Saints are no longer sentimental favorites anymore to play in the 2013 Super Bowl in their hometown. With all the perfect storms, and a brutal upcoming schedule, they will be hard pressed just to have a winning season. If they don’t, there will be no lovable losers tag affixed. who dat going to beat them Saints?